Who's ready for a garden party??? We are at Paper Sweeties!!! It is time for sneak peeks of our April Release! And hint, hint... it is perfect for spring! 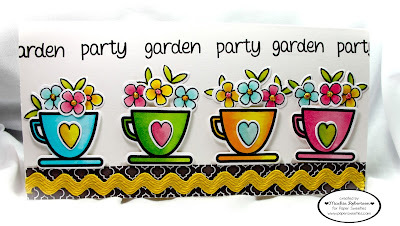 I stamped 4 cups from last month's release-Eat Cake. I colored them with Copic Markers. 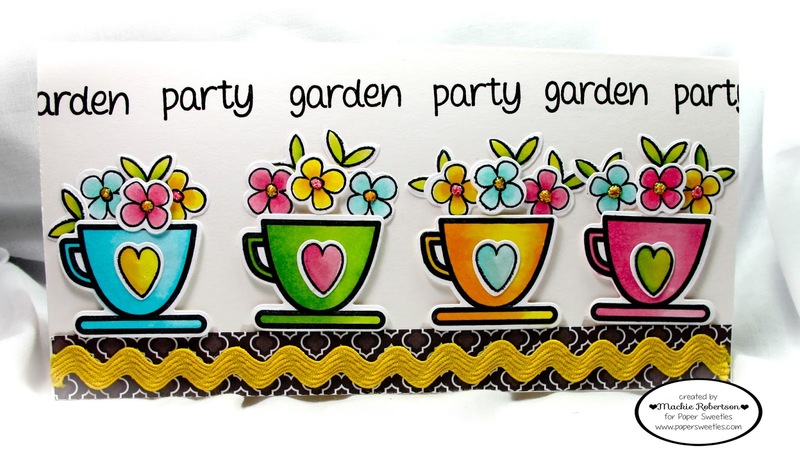 And I filled them with pretty blooms from the new April stamp release! Please come back tomorrow for the FULL RELEASE!!! LOVE LOVE LOVE! This is so different and awesome! Love the bright colors and the flowers in those cups are so sweet... LOVE! Oh my word! If this isn't the cutest. What a great way to use the new set. I'm definitely going to remember this design for the future. What an AWESOME idea!!! You're creativity never ceases to amaze me, Mackie!! Those little cups are overflowing with happiness!! CUTE card Mackie! Mackie, this is absolutely amazing! I love these bright fresh colors and your beautiful copic colors! SO pretty! Eeek! Such happy, little cups! I'd come to your garden party ;)!